Study featured in the journal International Organization, published by Cambridge University Press, reveals the quality of your research may be less important than your gender when it comes to being taken seriously by your peers. We know that women are getting tenure at lower rates than men, are being paid less than men, and are generally dropping out of academia at higher rates than men. Pioneering research reveals that, for scholars, the quality of your research may be less important than your gender when it comes to being taken seriously by your peers. A new study has found that female academics in the field of international relations (IR) have their work cited much less often than men. In the first study of its kind in political science, Barbara F. Walter, professor of political science at the University of California San Diego, and two researchers for the Institute for the Theory and Practice of International Relations uncovered marked gender gaps in citation patterns. Citation, when one academic bolsters their own thesis by citing the work of another, is crucial in academia because citation counts show how seriously a scholar’s work is being taken and how much it is influencing other research. The study, featured in the journal International Organization published by Cambridge University Press, examined hundreds of peer-reviewed articles published between 1980 and 2006. Researchers found that the gender divide was entrenched and robust across several research models and after all variables had been taken into account, including year and type of publication, the focus and method of research, the author’s theoretical perspective, tenure status, and which institutions they were affiliated with. The study also examined networks of citations between academic papers to explore the extent to which an author’s gender correlated with how many times their articles appeared in a citation network. They found that articles written by women were ‘systematically less central’ to these networks than articles authored by men. In her groundbreaking article, The Gender Citation Gap in International Relations, Professor Barbara F. Walter concludes that the gap is mainly present because men (who make up the bulk of IR scholars) have a preference for citing other men. However, she also reports that the tendency of female IR scholars not to cite themselves is also contributing to their low citation results. Male academics tend to cite themselves much more than females. Walter, an expert on international security and a former fellow of Harvard, Columbia and Princeton, served as senior author for this paper, with research conducted by Dan Maliniak and Ryan Powers, two Principal Investigators for the Institute for the Theory and Practice of International Relations which is based at the College of William and Mary in Virginia. For further information and to arrange interviews, please contact Michael W. Marvin, Senior Marketing Associate, Cambridge University Press by email at mmarvin(at)cambridge(dot)org or by phone at (001) 646.460.3467. Barbara F. Walter is a Professor of International Relations and Pacific Studies and Affiliated Faculty of Political Science at the University of California, San Diego. She has also been a fellow at the Olin Institute for Strategic Studies at Harvard University, the War and Peace Institute at Columbia University, and the Niehaus Center for Globalization and Governance at Princeton University. Professor Walter is an expert on international security and her current research and teaching interests include political accessibility, repeat civil war and how terrorism works. Walter is on the board of The American Political Science Review, Journal of Conflict Resolution, International Studies Quarterly, and International Interactions. She is also the recipient of numerous grants and fellowships, including awards from the National Science Foundation, the Carnegie Corporation of New York, and the Guggenheim and Smith Richardson Foundations. Dan Maliniak graduated in Government and Economics from the College of William & Mary in 2006 and is currently a graduate student in political science at the UC San Diego. His research interests include international relations theory and international political economy. Ryan Powers received his B.A. in Government from William & Mary in 2008. He is currently a graduate student at the University of Wisconsin-Madison studying international relations, political economy, and international organization. Prior to graduate school he worked as a Research Associate at the Center for American Progress. Maliniak and Powers are both Principal Investigators on the TRIP (Teaching Research and International Policy) project at the William and Mary Institute for the Theory and Practice of International Relations. 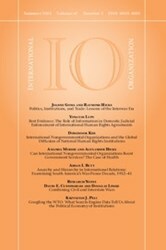 International Organization is a leading peer-reviewed journal that covers the entire field of international affairs. Subject areas include: foreign policies, international relations, international and comparative political economy, security policies, environmental disputes and resolutions, European integration, alliance patterns and war, bargaining and conflict resolution, economic development and adjustment, and international capital movements. Learn more at journals.cambridge.org/INO. Cambridge University Press publishes more than 300 peer-reviewed academic journals across a wide spread of subject areas, in print and online. Many of these journals are the leading academic publications in their fields and together they form one of the most valuable and comprehensive bodies of research available today. Learn more at journals.cambridge.org. Playing a leading role in today’s international market place, Cambridge University Press has more than 50 offices around the globe, and it distributes its products to nearly every country in the world. Learn more at http://www.cambridge.org.